I haven't played as much Magic as I would normally like to. Heck the last game I played on MTGO was a four player game of Brawl for CheshirePlaysGames and his BrawlStars Series. I took a deck tuned for 1v1 battle into the game, because I was a last minute addition, and honestly I just wanted to play. It something my therapist would have been proud of, as I am still struggling with things, but meeting three new people and interacting was honestly a good thing. 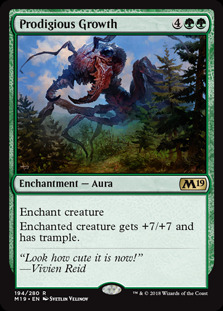 I can't really think of a great reason to have not played Magic for two months, but before I knew it, May turned to June, and July was here quicker than a hiccup. Standard was reasonable, Modern is still great, Arena and its lack of crafting is still very much not for me, but I just didn't have the drive to log on and play. I've got a few decks on the client, but actually sitting down and making time to play took a backseat. I was working on my vanity site a bit more, and reviewing video games from years ago for it, so I spent a lot of time playing and beating Shining Force, Shining Force II, and Secret of Mana. I started playthroughs of Xenogears, Kingdom Hearts, Dragon Quest VII, Reverie and Baldur's Gate, thanks to a generous gift from BlastodermMan, but like everything else, those projects were put on the back burner, and I still have a ton of responsibilities to IndieGamerChick for her Indie Game Giveaway Party. Something I've done more and more recently, or at least something I've noticed more, is that I go as hard as I can on something for a period of time, usually two to three weeks, and then just drop it for a while. I used to spend 40-60 hours a week playing Magic, but I justified that as getting ready for Grand Prix or Pro Tour Qualifiers. Without that justification Magic took a backseat. Without writing, be it Magic or video games, those things got put in the furthest back seat, but really, I'm probably just super unhappy, and looking for whatever distraction I can take. Right now it's digital free to play card games, I'm going super hard in Hearthstone, Eternal and Pokemon, but after PokeWorlds in a few weeks, there is no telling what I am going to end up doing to distract myself. It might be video games again, or it might be tuba stuff. I don't even know anymore. What I do know is right now, I kinda like Magic again, and can feel myself starting to go hard again. 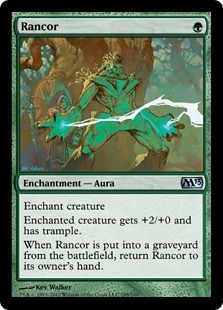 Core Set 2019, while weirdly named, brought back one of my favorite cards of all-time, Blanchwood Armor . 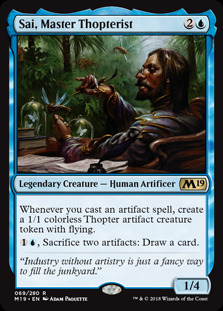 When I was a young mage, my father would take me into the city, to play a lot of games (My father did not actually take me in to the city to play a lot of games, I was in college when Urza's Saga first released, so it was public transportation that took me to a used book and CD store to play a bunch of games). Blanchwood Armor was typically in my decks at the time, because well, I was not exactly well off, my extra money went to band related expenses, or laundry. It was easiest to build Mono Green Stompy, Inquest said it was a pretty good deck, and who was I to argue with them? I mean they only said Necropotence was a one star card, they clearly knew what was up! 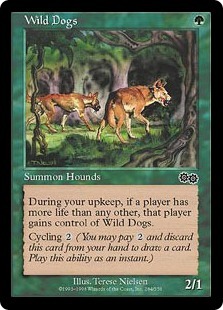 Sleeving up Wild Dogs , Albino Troll and Pouncing Jaguar with my Blachwood Armors would make me competitive, but as a newish player (well to tournaments at least), and one clearly on a budget, competitive was good enough to maybe take a few points of life away from the sharks that swam at that location. 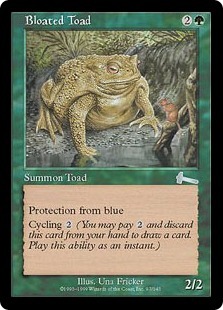 I didn't actually start to win until Bloated Toad was printed. Yeah somehow I managed to take games with the protection from Blue frog and Armor, or maybe it was more because of Rancor . I want to say it's because of the frog though. 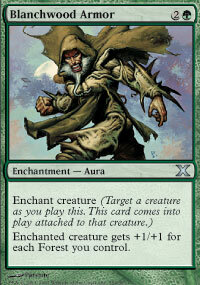 I've liked Protection abilities and Enchantments to put on those protected creatures for a long time. 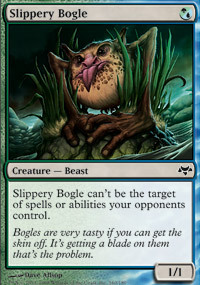 It's why I enjoy watching Bogles in Modern, and why Bogles is one of the few Pauper decks I'll actually play whenever I am in the mood to play Pauper. The Hexproof ability is not the best for Magic, especially when it is put on cards like Gladecover Scout , Slippery Bogle or Blighted Agent (Are you paying attention? 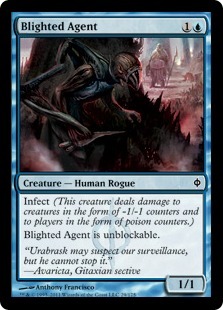 Because Blighted Agent doesn't have hexproof, it's unblockable, unlike me on Twitter!) 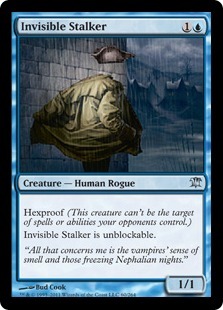 Invisible Stalker (Which has both Hexproof, a mechanic I like, and unblockable, a mechanic that I do not like). 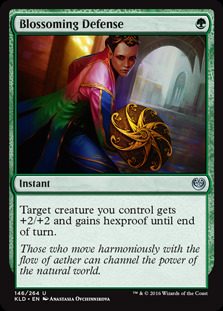 However, when Hexproof is done right, well, sparingly, it is when it's on a mid or lategame threat. Something like Carnage Tyrant , which is a huge threat, but also takes forever to cast because six is a huge number, much like 42, or 131. 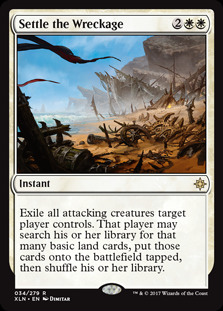 You can have this huge threat, but it comes down on a fair turn and still allows your opponent time to answer with a mass removal spell. 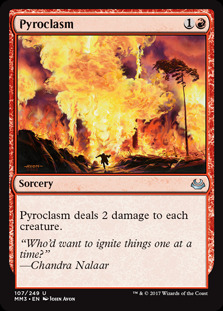 It's a little more fair than the aggressive Modern Bogles deck, because well, games can fundamentally be over on turn two thanks to Totem Armor to protect it from mass removal like Pyroclasm or Anger of the Gods and Ethereal Armor making a mockery out of damage based mass removal. Of course it's only really fair if it's coming into play on turn six. 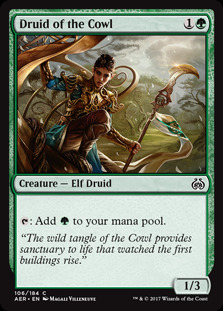 If Llanowar Elves and Druid of the Cowl are accelerating things though, it gets to be a little more unfair, sometimes as early as turn three for a Carnage Tyrant to come in to play. Not only did Blanchwood Armor come back to Standard, but Core Set 2019 gave us the Mare cycle, which to me is a really sweet redo of sorts for Protection. It simplifies things when it comes to combat, which is where you want protection to shine, but makes it much easier for players when it comes to spells that target the creatures. Protection from Color was one of the hardest things to explain to a new player, and there was so much stuff to keep in mind (think of BREAD) when playing with it, that I am glad it's out of the game (or rarely used, I can't remember the last time I saw Protection from color in Standard, and I am kinda too lazy to look that up.) I have family that raises horses that lives down the street from me, and the owner of Legitmtg.com has family that does the same (Because Kentucky knows three things incredibly well, basketball, bourbon, and horses) so the mare cycle made me a little happy, it cleaned things up and made some interesting cards. Except for Vine Mare , that card was a dang mistake. Congratulations, after nearly 1200 words we get to the point of the article! 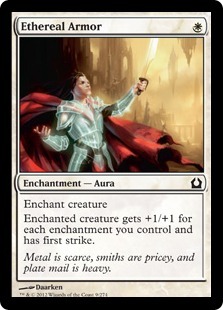 A couple of weeks ago, the fine folks at MTGGoldfish highlighted a sweet deck that I just had to take for a spin. With a price tag of under 50 tickets, and a highlighted spot in WotC's decklist reporting, I figured I couldn't go wrong if I picked it up. 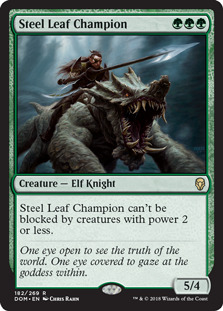 I knew that Steel Leaf Champion was the kind of card that could just dominate some matchups and putting an Armor on it seemed appealing to me. 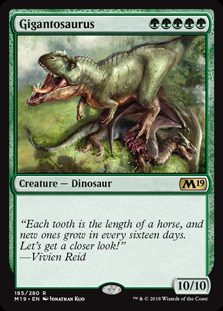 Getting to cast Gigantosaurus also seemed like a ton of fun, as 10/10s for five without a drawback seemed like a super sweet thing. 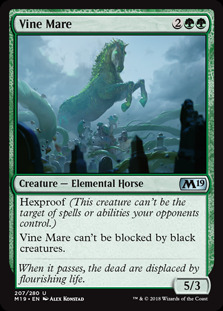 It would also give me the bulk of Steel Leaf Stompy in case it wasn't super good against the field, so without any real excuses, I was going to digitally sleeve up Vine Mare, put an Armor on it, and scream sing about my amazing horse. Here is the decklist for those interested, and here is the Instant Deck Tech and some game play. SaffronOlive continues to do amazing work. I do not want to take away anything from the deckbuilder, TannerBananer, but after personally getting some games in the deck felt like it was missing things. 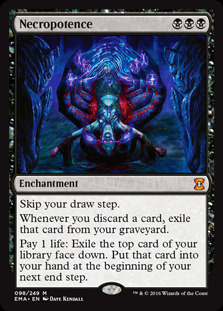 Yes, against decks like Zombies or Mono Black Aggro, the deck has a great matchup. We get to blank so much of their removal, and then make combat impossible for them to win because of Vine Mare. 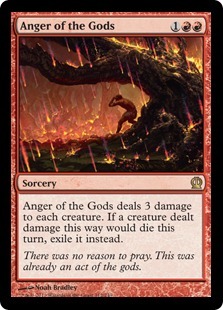 Against Mono Red we take some early damage and then just rain giant monsters down. 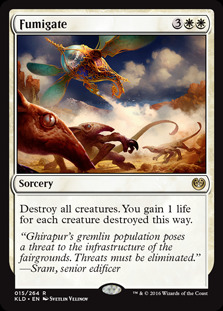 Gigantosaurus really shines here, because unless they get the Goblin Chainwhirler start, our mana elves are going to ramp us up to monsters that are really hard for them to deal with. 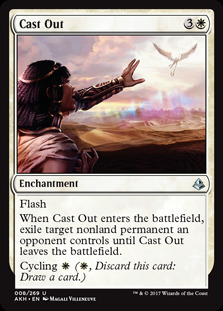 We're not great against the Fumigate or Settle the Wreckage decks of the format, but we force those decks to have those exact cards, because if they don't stuff like Cast Out and Seal Away are not very effective against our hexproof threats. 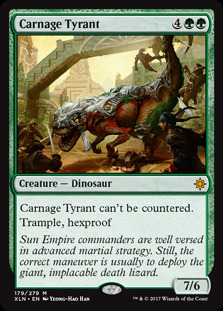 Of course we also have Carnage Tyrant against those matches as well. 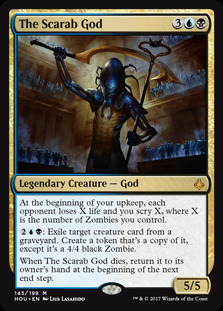 I like the matchup with The Scarab God because Vine Mare again really shines. It gallops past the actual god, and trots away unscathed from the tokens that it makes. The Mono Blue Artifacts matchup is nearly impossible for the Hexproof Horse squad to actually beat. Sai, Master Thopterist gives this deck a huge cushion. Unless we have Cartouche of Strength to deal with it, or Key to the City or Rhonas the Indomitable to give trample, the thopters that Sai makes gives them endgless time to set up their deck. If we can't break through, they are under no pressure, because really, the deck lacks reach. Gigantosaurus is a really cool card and all, but it lacks trample. 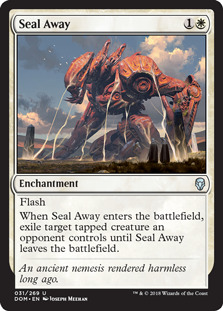 Steel Leaf Champion can battle underneath the tokens, but that may not be fast enough without Blachwood Armor, because the deck can just create so many tokens when Sai is in play. This is why I appreciate the Key to the City addition that SaffronOlive made. 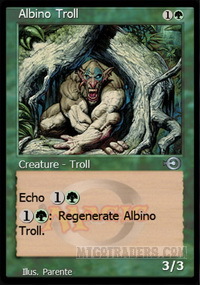 Not only does a creature become unblockable, but it also provides a card draw engine when you start to run out of gas. In my experience the worst card in the deck was sadly the largest. Gigantosaurus is capable of ending the game quickly, which is why this monster does not naturally have trample. While we may be able to have more than one in play at the same time, the lack of trample is really this cards downside. 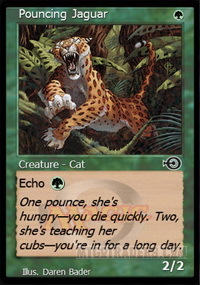 Ghalta, Primal Hunger can come in to play for a similar cost, has two more power, and trample, but is also a legendary dinosaur, which makes having more than one in play at a time on your side of the board impossible, or a game rules violation. 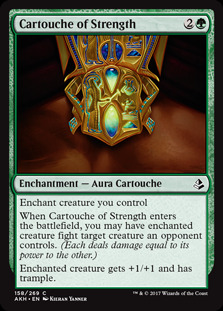 I frequently found myself wanting another copy of Cartouche of Strength and Rhonas. I never played the Key to the City build that Saffron presented, I can see it being surprisingly effective, so I think trying that out would make a lot of sense. However, I got super attached to Blossoming Defense as it is clutch in protecting our drops that do not have hexproof naturally. I would for sure though cut all the copies of Gigantosaurus. The card, while exciting and flashy just did not do enough unless the board was clear. I would add at least three copies of Ghalta, because while we want to draw and play one early, we're not huge fans of drawing more than one. Another card I wanted to play around with was Prodigious Growth . 6 mana is a lot for an aura, but it would act as an additional copy of Cartouche, in the way that gives a creature trample. It would also turn our elves into monsters in the late game. 1/1s are not too bad, but turning making them 8/8s with trample is awfully fearsome! Have you played this deck at all? What did you think of it? What changes would you make? Let us know in the comments and thanks for reading! I completely id with much of your intro Josh. Probably dead on analysis for my own reasons for not playing sometimes. I think maybe the worst part is, the past couple of days I've tried to play some brawl, but can't get a game. I wait for like 10 minutes and then give up. I'm trying to play, but can't really do it in the small periods of time I carve out for it exclusively. Ive had this experience as well. Anxiety + impatience gets the better of me.